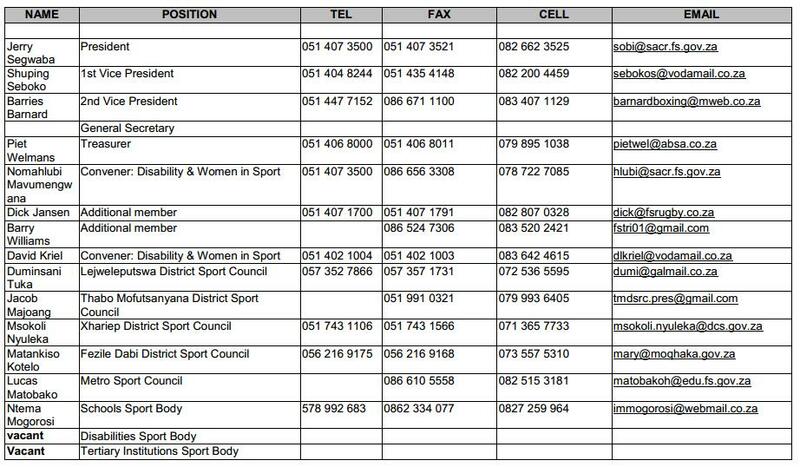 The Free State Sport Confederation (FSSC) is the controlling body of sport in the province and is constituted by all Sport Federations as well as Local and District Municipal Sport Councils in the Province. A strong link between the Department and athletes, whose objective is the promotion of sport and recreation, will be enhanced by this structure. Free State School Sport Controlling Body (FSSSCB) was officially launched on the 28th April 2010 at Grey College in Bloemfontein. This structure was the second of its kind to be established in the country. It was established through a consultative process from local level to provincial level of management of school sport. The FSSSCB comprises of Local School Code Committees, Town Code Committees, Zonal Code Committees, District Code Committees, the Provincial Forum and the Provincial Executive Committee. The Provincial Forum is represented by chairpersons of Code Committees, School Governing Body members and the Teacher Unions. The Executive Management Committee is constituted by the elected members of the Provincial Forum.The Provincial Committee is structured as follows: the Chairperson, Deputy Chairperson for Secondary Schools, Deputy Chairperson for Primary Schools, Deputy Chairperson for Learners with Special Needs (LSEN) Schools, Secretary/Treasurer and one Additional Member as well as two officials from Syrac and two officials from Sport and Talent Development (STD) programme in the Department that serve as ex officio members.